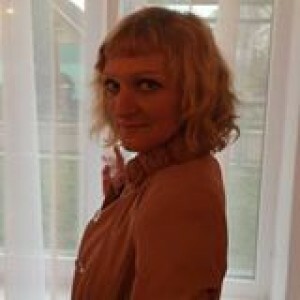 Як відомо, одяг виникла майже разом з появою людини. Тепер – це невід'ємний атрибут нашого життя. Даний урок англійської присвячений одязі або clothes англійською. Дана тема важлива тим, що clothes – наш повсякденний атрибут, тому він часто-густо зустрічається в мовленні. 1). Greeting ( 1 minute ) T – Good morning, students! Ss – Good morning, teacher! T – Nice to meet you! Ss – Nice to meet you, too! T – What a lovely day today! Our lesson today is unusual. There is a picture on the board, but it is hidden. We’ll open it space by space by doing some interesting exercises. Ok? We continue to speak about “clothes”. So, let’s open the first space. T – Let’s play a game, which is called “The chain”. The first student says a word, which refers to “Clothes”. The second student repeats the first student’s word and adds his own word. The third has to repeat two words and add his one. Foe example, 1: Tshirt; 2: T-shirt, suit; 3: T-shirt, suit, blouse. […] T: Well done. Let’s open the next space. T – Now look at the board, please. Can you read these words? 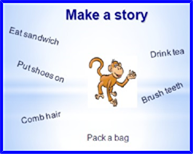 S1 – Eat sandwich, comb hair, drink tea, put shoes on, brush teeth, pack a bag and a monkey. T – Excellent. Well, I also try to do it and create a poem. So, you can easily learn it and get fun. Let’s read. S2 - Eat your sandwich. Say “Hello!” To your monkey. 2. Main part of the lesson. T – We continue to open our picture and the next space contains a tongue-twister. Let’s try to say it. Ss – She sells seashells by the seashore. The shells she sells are seashells, I’m sure! T – Super! Let’s try to pronounce it faster. […] as fast as you can […] Good job! The next space contains some games!!! It’s time to get some fun. (A teacher may use computer CD disk with games «Primary i-dictionary – 3. T – Look, please, at the board. These are… Ss – Clothes. T – Yes, let’s revise the words. Just repeat after me. Ss – Belt, gloves, sunglasses, earrings, mittens, wellington boots, necklace, . T – Good job. Now we’ll practise in spelling and writing the words. Then you can find a picture to a word. Be very attentive! T – Which space is the next? Let’s open it. Ss – Space number five! 3). Listening (5 minutes) . T – It’s time to relax. Let’s listen to the song about fashion show. Listen careful and try to remember every trifle. […] Ok, these are the words of the song, but something is missing. Let’s recollect the words! Our great, big fashion show begins. 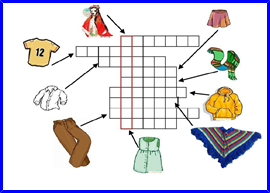 Answer Key: costume, t-shirt, blouse, skirt, scarf, sweater, poncho, trousers, dress. T – Let’s check whether you can spell the words. There are some words, but letters are mixed. Our task is to unscramble the words. Blet, wderunrea, shyin, tedpots, priedst, senttim, tepock. 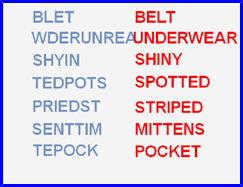 Answer key: belt, underwear, shiny, spotted, striped, mittens, pocket. T – Perfect! We spoke and wrote, and sang a little, it’s time to read. This is a text for you, which is called “The English Lesson”. But it’s not finished – the last sentence has gone. Let’s read it one by one and think about the ending. Ss – George was sitting in his class. It was a hot afternoon and he was feeling sleepy. It was a grammar lesson and George was also bored. He hated grammar. He wanted to leave school and work. He wanted to be a gardener. George loved flowers and trees. George looked out of the window. He looked at the trees and flowers. Then he started day-dreaming. T – What do think, what did he say? T – So, what is the hidden picture? Yes, it’s the symbol of the championship “EURO-2012” Let’s look what uniform different countries have. […] Just imagine the situation that you are young designers and your task is to create new uniform for our national team. T – Good job! Time is up! Unfortunately, we have to finish. I liked the lesson. What about you? Ss – Yes, we did. T – Your home task is to retell the story “English lesson” and finish the project. You worked really hard today and I have some marks for you […] Ss – Thank you. Урок за темою «Одяг» є швидким за темпом, охоплює всі види мовленнєвої діяльності та спонукає учнів активно приймати участь у запропонованих завданнях. Кожен учень знайде в цьому уроці завдання до душі. Хтось любить співати, хтось малювати, комусь подобається вирішувати кросворди, ребуси та головоломки. 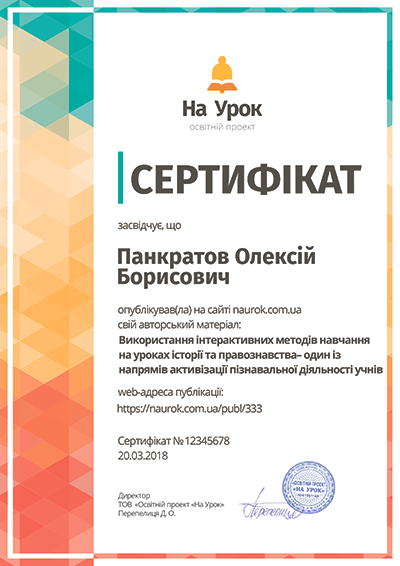 Дехто любить читати, а хтось складати розповіді чи вірші. В будь-якій комбінації учні вдосконалюють навички вживання лексичних одиниць за темою «Одяг». В учнів відроджується інтерес до вивчення іноземних мов. Застосовуючи творчий підхід, вчитель спонукає учнів до творчості. Учням, особливо середнього шкільного віку, завжди цікавіше на уроці, який має щось більше окрім підручника та зошита. Тому, я вважаю, засобами виконання саме творчих завдань, таких як складання історії про мавпу, розучування вірша, скоромовка, пошук кінцівки до розповіді «На уроці англійської мови», створення нової форми для збірної команди України з футболу та інші, очікувані результати досягаються в повному обсязі. 1. George Woolard “Lessons with Laughter” – London: Heinle Cengage Learning, 1996. – 94p. 2. Herbert Puchta, Jane Arnold, Mario Rinvolucri “Imagine That!” – London: Helbling Languages, 2007. – 191p. 3. Herbert Puchta, Scott Thornbury “Teaching Grammar Creatively” – London: Helbling Languages, 2006. – 264p. 4. Ann Baker “Tree or Three” – Cambridge: Cambridge University Press, 2006. – 129p. 5. Jonathan Marks “English Pronunciation in Use. Elementary” – Cambridge: Cambridge University Press, 2007. – 166p. 6. Anna Wieczorek “Primary I-Dictionary. High Elementary” – An interactive picture dictionary – Cambridge: Cambridge University Press, 2011. – 166p. 7. Ворожейкіна О.М. «100 цікавих ідей для проведення уроку» - Х.: Вид.група «Основа», 2011. – 2-ге вид, перероб. – 225с. Матеріали до уроків англійської мови "Граматичний довідник". Збірник "Граматичні вправи англійської мови"